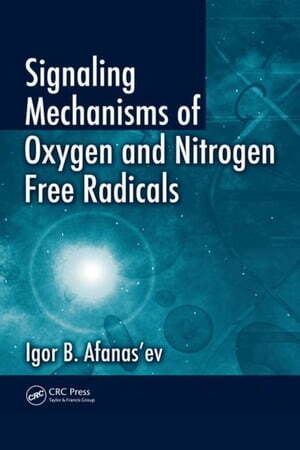 Collins Booksellers - Signaling Mechanisms of Oxygen and Nitrogen Free Radicals by Afanas'ev, Igor B., 9781420073751. Buy this book online. Once the existence of free radicals was proven, an avalanche of studies on free radical-mediated biological processes ensued. The study of reactive oxygen and nitrogen species (ROS and RNS) is center stage in biological free radical investigations. Written by a biochemist, Signaling Mechanisms of Oxygen and Nitrogen Free Radicals discusses the regulatory functions of ROS and RNS in physiological and pathophysiological states. An exploration of the main questions of signaling mechanisms of reactive oxygen and nitrogen species in enzymatic processes, this book draws attention to the chemical mechanisms of these reactions. It elucidates the differences between signaling functions and damaging effects of ROS and RNS in biological systems. The text also covers free radical signaling processes catalyzed by enzymes, producers of superoxide and nitric oxide that are able to use produced ROS and RNS as signaling species in their own catalytic processes. It then examines ROS and RNS signaling produced by mitochondrial enzymes. The author explores signaling functions of ROS and RNS in enzymatic heterolytic reactions, supplying important data on ROS and RNS signaling in the catalysis by the enzymes which do not produce free radicals by themselves. He provides information on signaling by reactive oxygen and nitrogen species in apoptosis and aging/senescence and concludes with coverage of mechanisms of free radical signaling in enzymatic processes. The book provides new understanding of signaling functions in living organisms related to cardiovascular processes, cancer, inflammation, hereditary diseases, and their regulation of physiological functions such as development, aging, and senescence. This information can support the development of new drugs and novel treatment methods.